Silver lost Rs 280 to Rs 49,670 per kg on falling demand among industrial units and coin makers. Gold and silver prices dropped in the national capital today on emergence of profit booking by stockists at existing higher levels and reduced offtake by investors amid a weakening global trend. Gold plunged by Rs 120 to Rs 30,810 per ten gram,while silver lost Rs 280 to Rs 49,670 per kg on falling demand among industrial units and coin makers. Traders said stockists selling at existing higher levels following recent upsurge and investors shifting their funds from bullion to rising equities mainly pulled down precious metal prices. They said a weakening trend in overseas markets,where gold fell from a one-week high on expectations that US lawmakers will find a compromise over the debt limit as the economy improves,further influenced the sentiment. Gold in overseas markets,which normally sets price trend on the domestic front fell 0.2 per cent to USD 1,316.73 an ounce and silver by 0.3 per cent to USD 22.23 an ounce. In the national capital,gold of 99.9 and 99.5 per cent purity dropped by Rs 120 each to Rs 30,810 and Rs 30,610 per ten gram,respectively. The metal had gained Rs 620 in last three sessions. Sovereign held steady at Rs 25,100 per piece of eight gram. 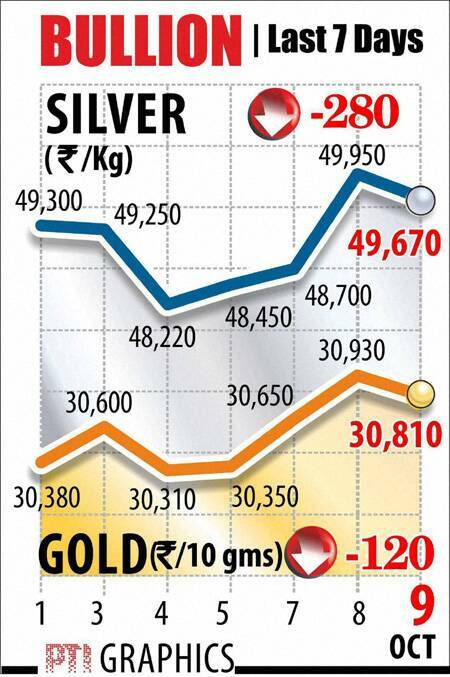 Silver ready lost Rs 280 to Rs 49,670 per kg and weekly-based delivery by Rs 100 to Rs 49,550 per kg. The white metal shot up by Rs 1,730 in last three days. Silver coins plunged by Rs 2,000 to Rs 85,000 for buying and Rs 86,000 for selling of 100 pieces.